What's your current news about? I was just wondering what are some of the news issues in your area of the world. International, local, etc, As the Scottish Independence vote creeps up, it just makes me wonder, what are people talking about in your area? They seem preoccupied with IS terror, the baby taken by his parents from a Southampton hospital, plus the Rotherham child abuse scandal covered up by the police. Right now ESPN is in Fargo for College Game Day. Our college, North Dakota State University, has won the title the last 3 years and they're here to kick off the football season. Since its being televised on ESPN tomorrow everyone in town is in a football frenzy. I, however, shall be hiding far from the sports maniacs. Our general election is coming up in a week (same day as the vote for Scottish Independence) so all we're hearing is politicians vying for votes. There's been a big hoo-hah about leaked political emails with a book 'Dirty Politics' just published, showing the underhand tactics politicians use to discredit each other ....no news there really! Aside from the ex-mayor of New Orleans going away for corruption.....messy trial. Ten year sentence. It's the usual. Peak time for hurricanes around here, but nothing on the horizon, thank goodness! I usually find elections and referendum times dull..mainly due to politicians being dull all the time. They do it rather well. I've been bad at watching the news lately, what with the move and things, but there's usually something about Putin and Russia. A lot of IS stuff on our news. Australia's terror alert was raised yesterday. Also the news of Oscar Pistorius being found not guilty of murder but guilty of manslaughter. And my footy team won an important game tonight. I love local elections (I used to work in news radio) and all the different issues being voted on, the politics involved. Here the news is pretty much dominated by Putin and IS, our news is not dominated as much by International news. Nationally, everyone is talking about Ray Rice, an NFL player who was caught viciously beating his wife on video. He has been suspended indefinitely from the NFL. 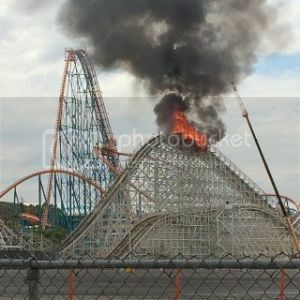 Also, a HUGE 36 year old wooden Rollercoaster burned down in Los Angeles. A lot of IS stuff on our news. Australia's terror alert was raised yesterday. The focus of our local news here is about Manchester Dogs' Home - someone burned it down and around 60 dogs were killed. Awww, this is so sad . Some of our local news has been about the 70 years liberation of this area. Other than that I'm not really sure at the moment (I haven't checked in a few days), I don't keep up with the news every day because it makes me sad and it tires me. The chaotic results of yesterday's election. A complete mess since no one wants to give any influence to the anti-immigration party that got a whopping 13% of the votes. The left/center parties and the right-wing parties are both too small (less than 50% of all votes) to build a government. And they refuse to work together. All except two left/center parties that are willing to work with the right-wing parties. But if they refuse, which they seem to be, the f-ing racist party will automatically get the power to break any government propositions. It's like a sandbox and children refusing to play with the "winners" of the election. If you can even call them winners considering they won't be able to make any decisions without support from the others. I was just reading about this- your elections sound really complicated! Lots of parties. Too many! 50 years ago, there were like only 6 parties, so it was easier for one of them (most often the social democrates) to get a majority. Nowadays, everyone wants to start a new party. The feminist party (yeah, a party with its major topic making the society more feministic) got 3% in this election. There is even a party called the Donald Duck party. There are like 100 parties to choose among. Most of them are jokes, so they don't get more than a couple of votes. I voted for the social democrates, and I hope the other parties will just stop acting childish and do what is best for the country instead of sulking and threatening to vote against the minority government any chance they get. I am beginning to understand why people are fed up with politics all over the world. Same childish behavior everywhere. That's ridiculous! When we had the race for Governor that Arnold Schwarzenegger won, we had about 50 people running and most were silly. Like, one guy's sole purpose was to allow ferrets as pets in California. 100 parties We only have two major ones, the others are considered a joke. I am a Libertarian (capital L ) but vote Democratic as I agree with a lot of their platform (support for gay marriage, universal heath care, etc). I don't know if that means the same thing in your country? That "anti immigration" group sounds really scary I don't understand how if they got only 13%, why they have the balance of Parliament? 9 of the parties are serious and get over 2% of all votes. The social democrates that has led Sweden for the most part since 1900 got 31.3% of the votes. 2nd biggest party got 23.2%. Third biggest party, the anti-immigrant A-holes got 12.9%. The Democrates in the US would be mostly equal to Sweden's 2nd largest party, Moderaterna. They are a right-wing party, but certainly not racists. Sweden has few parties that are so far to the right that they would equal the Republicans. None of the major parties are that far to the right. 8 of the 9 major parties in Sweden are anti-racism. All 9 are for universal health care. The anti-immigrant party and the christian party I would assume are against gay marriage. All others are pro, which is why gay marriages has been leagal in Sweden for some years now. And as Sweden is more to the left than the US, we have almost free health care (an operation or cancer treatment for instance doesn't cost anything), collage doesn't cost money, instead you get a small sum of money for every month you study, new parents get paid leave of absense (I believe it's 80% of your salary) for up to 480 days after the baby has been born. You get a certain % of your salary if you lose your job for x number of months (can't remember how many). You get insurance money if you get ill and can't work. That's crazy! I've heard of the National Front, of course and the Lega Nord. I had no idea illegal immigration was such a big deal. It is here too, with Mexicans and our border. Now that is just awesome! Is IS awesome. It's thanks the the social democratic party that set a goal in the beginning of the 20th century. Raise taxes and invest in good protection for everyone, not only the rich who can afford it. The more you earn, the more taxes you pay. That's why we don't have such a major gap between the poor and the rich in this country, even though there of course is a big gap. Just not an extreme one. And of course, all products come with taxes, so part of everything you buy goes to the state, who pays for welfare, school and investments of all kinds. The rich of course thinks they pay too much taxes, but IMO, who cares? They are rich. Poor rich people...... But in general, Swedes rather pay taxes than lose any quality of welfare and school or lose their protection if they lose their job or get ill etc. 2 Russian military aircrafts flew over Swedish airspace. Stay the f--k away, Russians! The election in Scotland. I hope they vote no for independence from the UK. Too many areas in Europe wants to break free. A yes in this election just may give others ideas. The terrorist threat that's just been foiled in Australia, the Scottish Independence result, the Fiji election and our general election tomorrow.